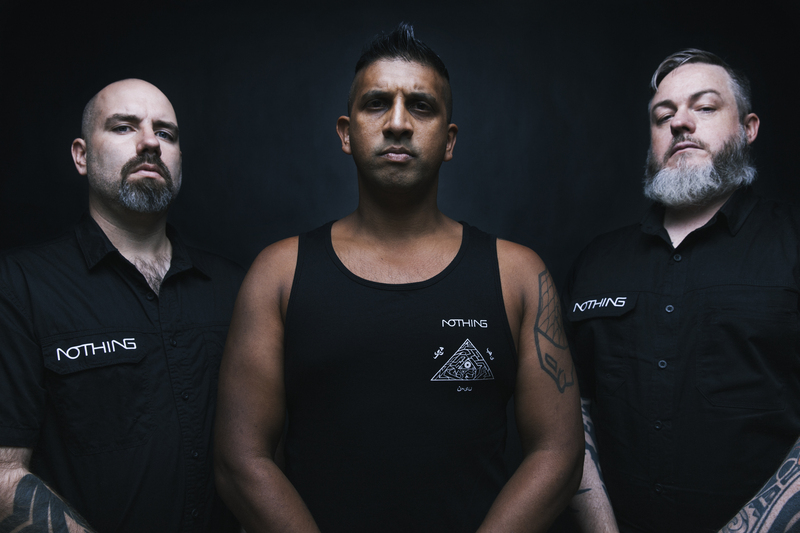 The technical groove, death metal act which is ‘Nothing’ has never been short of promise, and their musicianship has spoken for itself, having toured with prominent heavy metal powers like, ‘Five Finger Death Punch’, ‘Children of Bodom’, and ‘Amon Amarth’. The Melbourne band has never ceased to evolve, however, having fallen into becoming a 3-peice and completely changing their approach to writing music in the latter part of their career. ‘Craig Johnson’ asserts that their metamorphosis has only continued to strengthened Nothing, as I talked to him about the band’s upcoming release, popular and historic rock/heavy metal venues in Melbourne, and what he sees in metal today. I heard the band has just gotten back from a hiatus? Yeah, we had a bit of a hiatus. We were originally a four-piece, a more thrash-orientated band, but we had a line-up change which really prompted us to really lock down and do some writing and I guess redefine “the sound” of the band. Also, our drummer (‘Dale Van Haltren’) had an opportunity to live and work in the UK for three years. It sounds like you’ve been using the time off productively. Absolutely. I guess we locked into a sound that really resinates with us and a way of song writing. We’ve put in the work to really shape the branding and the image of the band to try and make an impact. You’ve grown up around the Melbourne scene – what can you say you’ve noticed over that time? I’ve been playing music for over 20 years and the scene has changed tremendously. Like everything, it goes in peaks and valleys. You go from having an influence of really amazing bands and really amazing venues to having a lot of venues close down. Now, there seems to be a little bit of a resurgence and some really great venues that are passionate and supporting the scene and I think, as a result, a lot of really amazing bands are striving, because they still have that opportunity to go out and play which is, at the end of the day, why you do this for. Are there any specifics venues (rock/metal hotspots) that you can remember, thinking back? I think one of the biggest ones is ‘The Esplanade’ in St. Kilda. It’s been an iconic Melbourne venue for years. It just closed down last year for massive renovations. I think everyone is waiting to see if it’s going to be the revered music pub that it was, or is it going to be more of one of these modern gastropubs that are more suited to your “Sunday afternoon beer garden” crowd. It was always a very iconic band venue; they had three stages, had some amazing band through there, it was right on the ‘St. Kilda Foreshore’, it was really a part of the Melbourne music scene. I think another one would be “the Tote” (‘Tote Hotel’) in Collingwood. It did actually get shut down but all the local residents rallied behind the venue and got it resurrected. Are there any bands that you currently follow? We’re all pretty old school, and there’s a handful of bands that we’ve been following for 25, 30 years – with social media you obviously get exposed to a lot of other bands as well, so music (in general) is very accessible these days, so there’s always bands popping up. Yeah it’s always funny that you always seem to lock onto some sort of sound. I think Djent is a classic example – the fact that it was even a genre I think is hilarious.The guys from Meshuggah kind of described their guitar sound in a satirical way, and it kind of took off with a genre [laughs]. But people lock in on that. I guess from a business side, if you were a part of a promotions company, you’d try and focus on that while it’s “hot”. But I think there’s always an adverse reaction as well – when one style is getting really pushed, it potentially makes people play a different style and work a little harder to diversify themselves and stick to what they’re doing, rather than just being a copy cat. There’s a balance to it. You’re going to get those copycat bands that think, ‘oh this is what’s in at the moment so we want to try and sound like that’. And then you get other artists that go, ‘well this just makes me want to push “my” style even more and show people that there’s more out there’. Each album of Nothing sounds unique; whether it was the bands mindset or just the “times”. But at their core, you still sound so heavy. Thank you, man. Actually, we got a new track coming out in November that we’re really proud of. We’ve got a lot of new material in the works. There’s always a “heaviness” and a “weight” to our sound. There’s groove, and we like to experiment and see where the song goes. So it’s fun. Going back to your self-titled LP (‘Nothing’, 2016) what was it like working with the other guys? I understand Dale is the longest active member? Yeah Dale’s an original member. Toby (‘Tobias Shanahan’) was in the band briefly, because he had a couple of other bands, but we brought him back just after we finished recording ‘The Torture of the Nameless’ (2005). But the latest release, I think all of us would agree is our strongest and is what we’re most proud of. The three of us have an amazing bond, an amazing chemistry, and we’re very much on the same wave length when it comes to music so we’ve really honed the way we write songs. No one brings in a complete song; we just bring in one, single idea. We jam it around, and we work on it, and everyone gets their input. It’s only when the all three of us agree that it works, and it’s at its strongest part that it can definitely be, that we then move forward and built on it. So it’s complete collaborative writing. You can definitely hear the chemistry in your 2016 self-titled album. You showcase such a combination of sounds and styles in a single track alone and, somehow, you make it work! Well the first two releases were very much influence by our friend Fabian (‘Fabian Kawahti’) who was the first vocalists and guitarist. When he left it really gave us a chance to really create something as a collaborative, rather than being driven by a single person. And we love the way it took shape. For some bands that’s how they function best; it’s by having one real driving force, and it’s amazing what it can do. Like, we were really lucky that Fab was so prolific in his song writing and the way he drove the band; but with the way we function now, it’s perfect for us. What can you say will be different with your upcoming material? There’s stuff on there that’s probably more groovy than anything we’ve written, but there’s some riffs on there that are heavier than anything we’ve written. I think the last album was us kind of developing our new sound, and this (the new material) is us just building on that. And the song can be really exploratory. You know, the thing we’re about to release is almost seven minutes long, but we’ve also just written a song that’s about three and a half minutes long, which is pretty rare for us. But it just feels right, so we’re playing with it. Lyrically it’s very different- I focused the last album very much on exploring an idea of “the ego is the enemy”. Whereas, this latest release is focused much more around the idea of escaping purgatory. I got very influenced by ‘Dante’s Inferno’ or a bit of ‘Divine Comedy’. I really loved that idea, so we’re building around that concept.